It was lunchtime and I sat down to eat at Chick-Fil-A. Across the street I noticed a Discount Tire and since my tread was wearing thin I decided to give them a call. I priced tires from two other companies and wanted a third opinion. The gentleman who answered the phone seemed genuinely happy. All the other tire shops went through the motions, but didn’t seem to care I’d called. Russell was different. He was enthusiastic. I’ve heard Steve Stagner, the CEO of Mattress Firm, say a sale is the transfer of enthusiasm. It must be true because I bought, and from this experience discovered a few gems you might find interesting. Our industry often compares buying a mattress to purchasing tires because both are infrequent and seen as not fun. I went into the tire buying process expecting a marginal experience, but my journey ended up exceptional and I think there are a few lessons for mattress retailers. Discount Tire had a nice looking building. That was my first impression and it mattered. Their store didn’t fit the standard image of a filthy tire shop. After seeing the building I decided to give them a call. When I searched Google for their phone number, I found it right away. That was a small touch point, but one that matters. The phone rang and a real guy who actually installed tires answered the phone. There was no menu to wander through or operator to filter my query. The fellow’s name was Russell and he was upbeat and enthusiastic. When I arrived Russell met me outside, shook my hand, smiled and seemed happy to see me. During the sale, he was helpful and offered his professional recommendation. Next, while eating my Chick-Fil-A I watched through a glass window while they put on my tires. After they finished, another worker named Tyler provided some quick education, reminded me about free rotations, and offered a pleasant farewell. Back at the office I checked my email and there was a receipt and a survey asking for feedback. The copy in the survey reminded me that my customer satisfaction was their top priority. You know what? I believed it. At Discount Tire, every single touch point was well orchestrated, positive and professional. A ski coach once said the most important turns are your last three—you need to finish strong and avoid getting lackadaisical just because you’re almost finished. Discount Tire nailed every single interaction. Shoppers like me have mandatories in mind. When it came to tire buying I was looking for a good deal, quick installation and good people. As a budget-conscious shopper, I probably would have gone with the lowest cost business if it was more than 10-15% cheaper than Discount Tire, but luckily I didn’t have to make that choice. Discount Tire lived up to its name and checked every other box on my list of must-haves. When I first spoke with Russell he said they could put on a new set of tires in 20-minutes. All the other shops required appointments and some were vague with how long it would take. I was on my lunch break and needed to get it done. If Discount Tire hadn’t delivered on their 20-minute promise I would have taken my medicine, but walked away disappointed. As you know, it did take 20-minutes and I was out the door. If you’re going to make a promise, be sure you can keep it. Russell did something I’d never seen. He took out a tool resembling a tire gauge and checked the tread to see how much life was left on my tires. 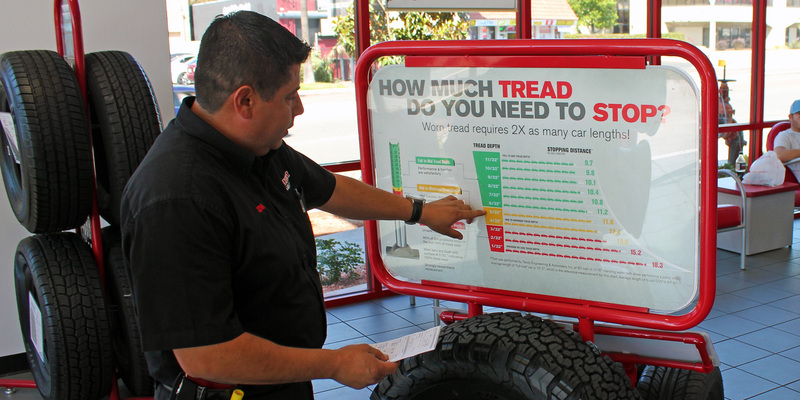 Then he took me to a colorful chart that showed what the tread depth meant in terms of tire life. I came into Discount Tires thinking I needed two tires, but I actually needed three. No, the tread depth trick wasn’t some sort of slick salesmanship. I went outside to see for myself and the rear tire was almost bald on the inside. I hadn’t noticed. We looked at the colorful chart and it clearly explained how much life was left. I was able to make an easy decision based on the tread-depth chart’s clear explanation. The only way Russell could have made that experience more powerful would have been to hand me the tool so I could check the tire treads. That would allow the shopper to own the buying decision. In the mattress industry, is your explanation easy to see and understand? Or is it convoluted and frustrating? Imagine you’re a customer. If you saw your building, searched online for the phone number, called the store, and came in to meet the salesperson, would it be an experience worth writing about? 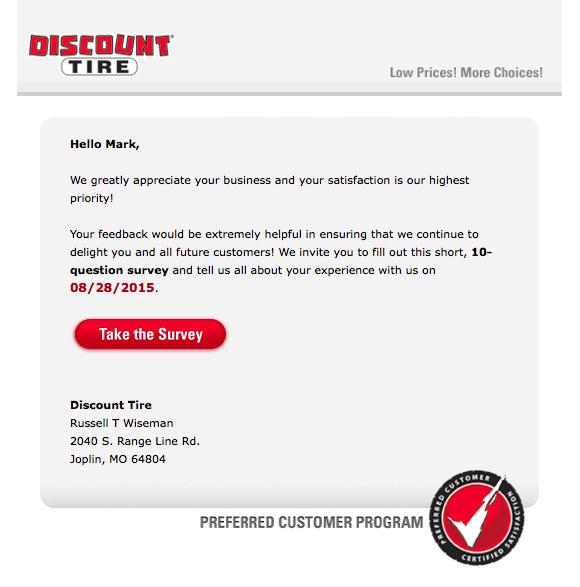 For Discount Tire, it exceeded my expectation and inspired this article. Evaluate your entire experience and make it something customers want to share with friends and family. If your store’s buying experience is not worthy of remarks (a.k.a. remarkable), reimagine the way customers experience your brand by evaluating and fine-tuning every single touch point. With 900 stores nationwide, it seems Discount Tire has discovered the secrets to engineering an amazing experience and I bet money they’d say it was worth the investment.